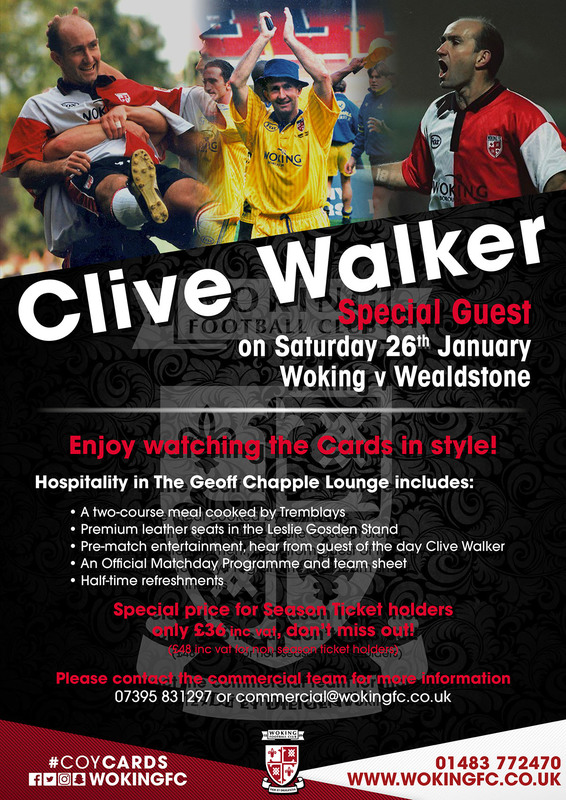 Woking Football Club is delighted to announce that Clive Walker will be the special guest in the Lounge this Saturday at the Cards' match against Wealdstone. Clive joined Woking in 1993, having previously played for Chelsea, Sunderland, Queens Park Rangers, Fulham, and Brighton & Hove Albion. He quickly became a fans' favourite and was integral in our FA Cup runs and three FA Trophy wins during his time at the club. He signed for Cheltenham Town after leaving Woking, where he won another FA Trophy and promotion from the Football Conference. Dowse said: "I've been nagging him for months to be a guest at a match, and it's great that he's finally agreed to do it, he's one of Woking's best ever players." Hospitality in the Lounge is priced at £36 for Season Ticket holders, with the normal price set at £48. To book you place please contact the commercial team at commercial@wokingfc.co.uk or 07395 831297.